Though iguanas are kept and loved as pets worldwide, some areas like Florida, often experience an over population and infestation of these docile lizards. 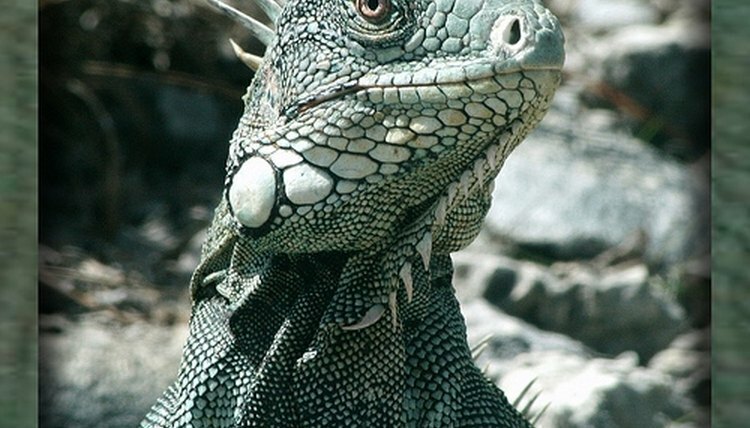 If these creatures increase in population and cause havoc, having the knowledge to properly and humanely euthanize an iguana can come in handy. Although such procedures should be always done by a licensed and practicing veterinarian, the steps below should give you guidance when those services are not available to you. Humanely euthanizing an iguana (or any animal) should be considered as a last resort. Consulting a veterinarian or Humane Society is strongly advised. This method will work best if you are dealing with a pet and have no means of reaching a veterinarian, or if you are dealing with a handful of iguanas. For mass infestations, it would be advisable to contact a Humane Society or a city official who can handle such cases. Obtain an animal trap such as a snare from an animal supply store, online or construct one yourself (see resources). You’ll want to set up the snare in a location that the iguana frequents and also make sure that it’s set up during the day, as they are only active during this time. Bait is also necessary to attract them to the trap. Iguanas are herbivorous animals and as such are known to eat many kinds of fruit, including bananas and mangoes. Iguanas can also be caught by hand or using noose poles. Check your trap at least once every 24 hours. Many areas have laws that require traps be checked frequently. Take special care to make sure that the trap is set up correctly. Incorrect or faulty traps can cause the animal harm and kill it. Once the iguana has been caught in the snare, attempt to remove it very carefully. Put on garden gloves before doing this. Take caution in approaching the snare so that you don’t frighten the already anxious animal. Open the snare and gently grab the iguana behind its head and under its belly. This will discourage biting. Place the iguana in a shoebox with holes so that it will not suffocate in the box. At this point, you can decide whether you would like to provide some food for it as a “last meal” or euthanize the iguana yourself. Remember, this is a last resort. Before euthanizing, you might ask yourself if there is anyone who can give a good home and take care of a pet iguana. Better yet, calling a pet adoption agency or shelter and seeing if they can either place the iguana in a home or in a sanctuary might be a great option. The last thing you would want to do is cause an animal harm. Transfer the iguana to a chest freezer and place it there. The only thing left to do at this point is wait. Since iguanas are cold blooded animals, they do not do well in cold temperatures and more or less will freeze to death as their metabolism slows down. Freezing the iguana is perhaps the most humane method of disposing them if you do not have a veterinarian to consult or cannot work on providing it with a good home. Check the freezer frequently. Remove the iguana after you make sure that it has been thawed and is no longer alive. Checking for vital signs will help determine this. Place the iguana in a garbage bag. You can dispose of it with regular waste, however do not throw it in any bodies of water. If you do not have any way to dispose of the iguana, contact a local pet shelter or animal organization. It might be helpful to check what services your particular city offers regarding animal disposal. Always remember to pre-bait the trap you use. Covering the trap with a bag is another option you might consider, if you feel that the iguana might display volatile behavior and receive cuts while attempting to escape. If you feel that you cannot carry out the task on your own or that you are dealing with a mass infestation, contacting an iguana or animal trapper should be the first step in your action plan. Always wear gloves when handling iguanas. You could possibly be exposed to Salmonella. This goes along with washing your hands thoroughly with a germ killing soap. Handling iguanas is not easy. They bite, scratch and whip their tails. Euthanizing an iguana is and always should be considered a last resort.